Hey there! Today’s post will cover something that is vitally important, but often considered irrelevant – the necessity to comply with system requirements. Software developers often cite on packaging and their websites the minimal system requirements for a computer to ensure the software functions without glitches. Once you purchased the program, you automatically agreed that your device complies with these requirements. That’s why you should always assess the system requirements before purchasing anything: it will spare you countless problems in the future. Kaspersky Lab products are no exception to this. 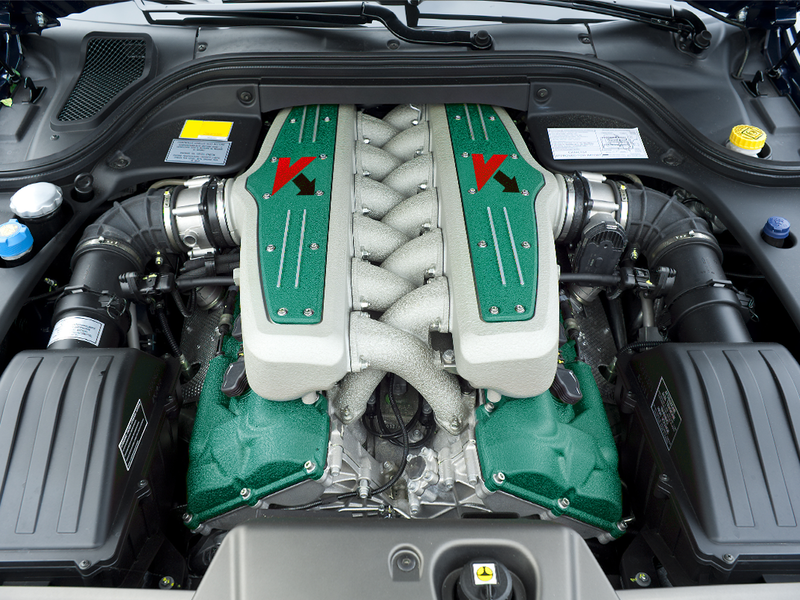 The products have a number of system requirements to the hardware. What are the most important aspects you should pay attention to when assessing the compliance with the system requirements? 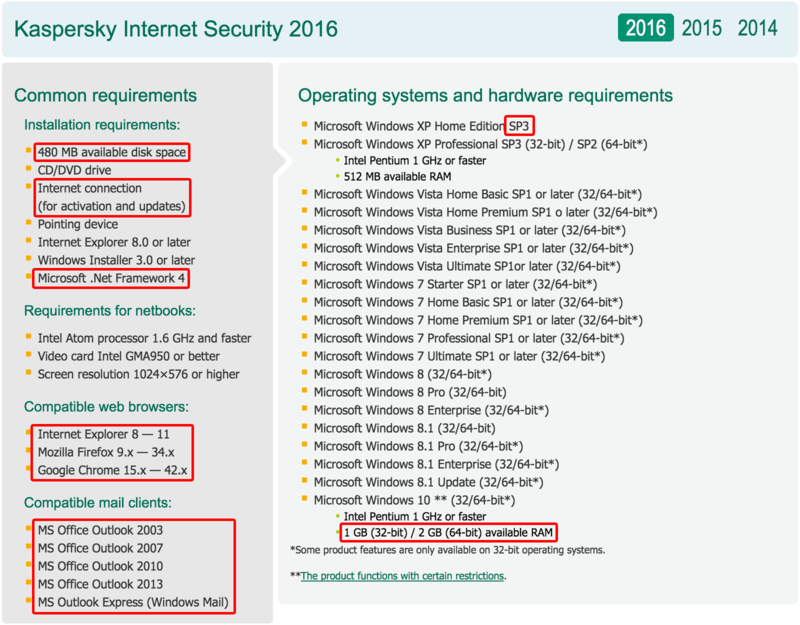 Let’s take a look at the requirements for Kaspersky Internet Security. On this screenshot we marked red those system requirements, which, if not complied with, would cause problems to our customers. I will explain in detail why each of them is important. Let’s begin with the trendiest phenomenon, considering the recent launch of Windows 10: incompatibility with the operating system. As you see, the list of supported operating systems is quite long. It even includes a long end-of-life to the dinosaur that is Windows XP. However, in the summer of 2015 our customer support group was flooded with complaints that our products would not install on Windows 10 systems. This came as no surprise! The main thing one should take into consideration when using our products is that we work only with commercial releases of operating systems. As you may know, Windows 10 was officially released on July 29. All the builds our customers referenced before were ‘technical preview’ or ‘release candidate’ – or, in other words, not final. We had the same situation when Windows 8 rolled out. If you ask me, pre-releases of OS are quite dangerous to install on your PC, especially if you are a corporate client. By now, Windows 10 is officially supported by our 2015 and 2016 ‘Home’ series products (those with the ‘С’ patch), which is clearly stated in the system requirements section. Windows XP SP3 is on the opposite end of the scale. The number of the ‘service pack’ is another important aspect of system requirements. As you might have noticed, the older SP2 service pack (which is used in many pirate builds of Windows XP) would not comply with our product’s requirements. Outdated Windows 7 versions would not do either (those which do not employ SP1). These OS versions are even theoretically not recommended for use, due to many security vulnerabilities. So, if you decided to install Kaspersky Lab’s security software, updating your OS to a more secure version is quite a logical step. There are specific cases when a user tries to install a ‘Home’-class product in a server-class OS (like Windows Server 2011). We should note here that ‘Home’ products are not meant for server systems. The term “Home” presupposes that the product will be used at home, on a regular Windows 8 OS, but not on a server. A server OS belongs to a separate, specific class of systems and requires specific security solutions. We should note that the majority of incompatibility cases are characteristic of users who either use truly obsolete OS versions or are just curious to try out anything new, even a year ahead of the official launch. Now, let us review other aspects of system requirements. If you OS is compatible, you should pay attention to hardware-specific requirements: available disk space and RAM. It’s quite straightforward that any app would need space to install and store its files. The system requirements state that our program requires minimum 480 MB. But in order for other apps and the OS itself to remain functional, some disks space is required (for instance it might be needed to store temporary files). That’s why 5-10 GB of space in the system directory on the hard drive would prevent the OS from stuttering. Also, the responsiveness of the system and the software depends on the availability of free RAM. I would stress the word ‘free’ here. That means that at any given time, the computer should have 1 GB (or 2 GB for 64-bit systems) of RAM available. So, the total volume of RAM on the computer should be higher. In the majority of cases, the old joke about “Kaspersky slowing down the system” means that a user decided to install our program onto an ancient laptop with 512 MB RAM. That’s no surprise the system starts to lag. Just remember that you Windows system would also need some ‘fresh air’ – in terms of enough RAM. There is another specific requirement: Internet connection. Time flies, and whereas before Internet connection was something unheard of in certain areas, now it’s a commodity. If there is no wired connection, there would be mobile network available. Should there be none of the above, there is satellite Internet. Just remember you cannot install home products without an Internet connection! Also you wouldn’t be able to receive database updates, and some of the newest protection means like Kaspersky Security Network would not be functional without active content. There are no keys or databases on thumb drives anymore. So let’s keep pace with current technologies! As a finishing touch, let’s talk about supported browsers and mail clients. They are also included into the list of system requirements, as we have encountered many cases of them causing problems. There are a couple of reasons for that. First, it goes down to Firefox and Chrome, the most popular web browsers. The developers of these two browsers update them so frequently that at times you just cannot catch up. Even telling versions apart is sometimes a challenge. But on the inside… If we decided to keep up with the browser developers, we would have needed to issue patches every month and have an entire department of coders and testers work 24/7 just to ensure browser compatibility. But as you know, our priority is providing the best level of protection, that’s why we cannot afford such a department. However, we apply considerable effort to provide browser compatibility. Our 2016 version uses a plugin-less technology, which allows our product to function independently of the browser version. We remain committed to further developing this approach. Another thing is personal preferences. Yes, we know that there are browsers like Opera, Yandex.Browser and the clones based on the Google Chromium engine. These alternative browsers have their loyal users, but their share globally is so small, that we don’t see value in providing compatibility with those. The same applies to mail clients. To conclude, I would urge you to study system requirements with care before the product is purchases. Better safe than sorry. This cautious approach will help you choose the application, which fits your device and be spared countless problems. We hope this application would be one of Kaspersky’s products. Our product range becomes increasingly wider, by the way!